Fairy really appreciates how lucky she is to have a happy, loving home here with her sisters, Marigold and Mariella. 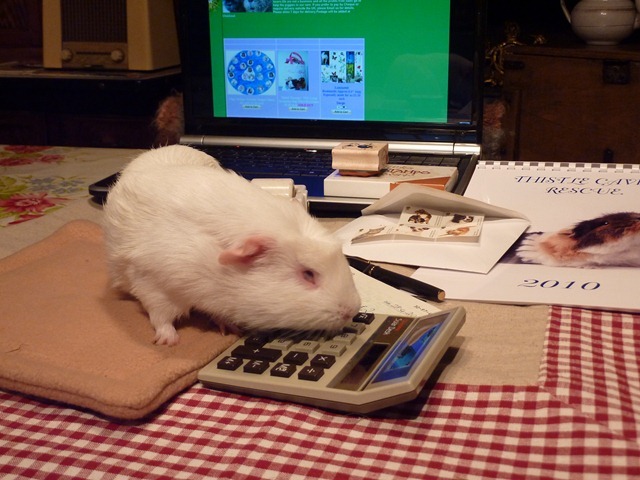 She enjoys top quality Guinea Pig food, has a beautiful bedroom, gym, playroom and garden. She has a personal specialist healthcare advisor and dentist. She has regular baths, cuddles, ear rubs and chin tickles. Her every need is catered for. 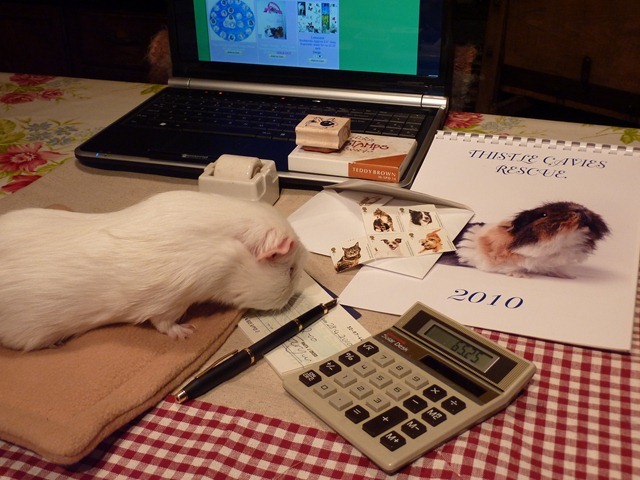 Not all guinea pigs are this lucky. Many find themselves unwanted, forgotten, abandoned, uncared for and unloved. They may become ill, but their need for healthcare is ignored. Their owner may forget to feed them regularly, to fill their water bottle, or clean them out, or allow them to exercise. Even more seriously, some piggy’s suffer physical cruelty. Thank goodness then, for people like Wendi, Karen, Julie, Lisa and many 100’s of others who rescue, care for and re-home these less fortunate piggies. They all deserve a very big pat on the back! They selflessly attend to health issues, feed a well balanced diet, and patiently nurture them to be happy, confident Guinea Pigs ready for life in a brand new, carefully selected ‘Forever Home’ where they will be loved and cared for in the manner they deserve. 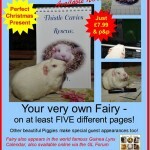 Fairy supports several Rescue Charities and Organisations in her own small way. She often makes donations from her pocket money, and lets everyone know what an invaluable service these charities and organisations perform. 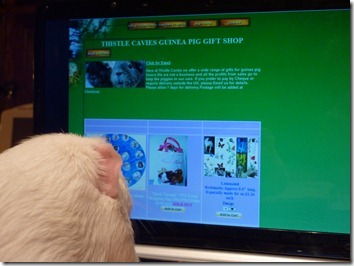 Thistle Cavies Rescue is one such charity. 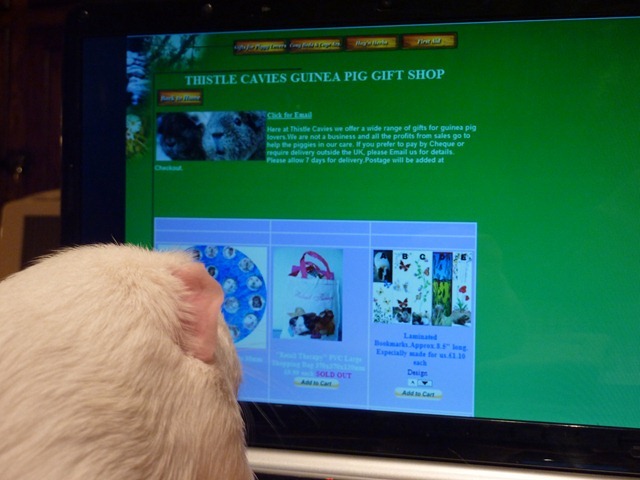 Here is Fairy checking out their online shop! This is a jolly good website! Look at those super Guinea Pig Badges! 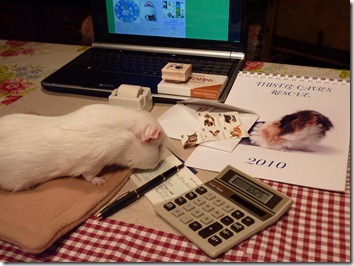 We already have a calendar from Thistle Cavies Rescue. It’s super! Let’s see, how much can I afford to donate this week! It may be a small amount, but I know that every penny will help! I just need to check this cheque! There! 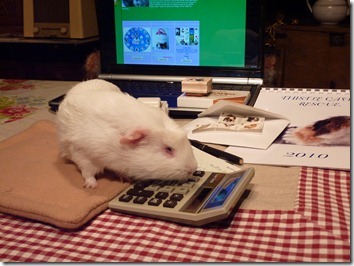 Please support your favourite Guinea Pig charity in any way you can. Aww, thank you! For various reasons Fairy does not approve of Pet Shops or breeders selling Guinea Pigs whose only intention is to profit from selling as many animals as possible with little regard for their welfare. 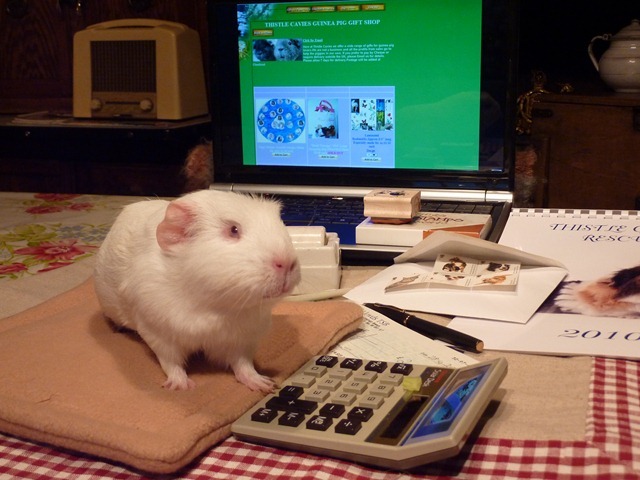 If you are thinking about getting a Guinea Pig please consider adopting rather than buying from a pet shop. There are 1000’s of beautiful Guinea Pigs looking for their special ‘Forever Home’ in rescue centres all around the country. If you know of a good rescue organisation I can add it to the list. This really is superb. Fairy is such a good little ambassador! Well done for bringing the plight of rescue guinea pigs to our attention so beautifully. Wonderful post Mildred, and wonderful cause. Our piggies came from a rescue near us. we always tell people to get them from rescues too. we donated when we got them and they gave us loads of advice. Fairy looks like she is reALly writing out the check. good for her! What a wonderful caring little piggy you are Fairy. 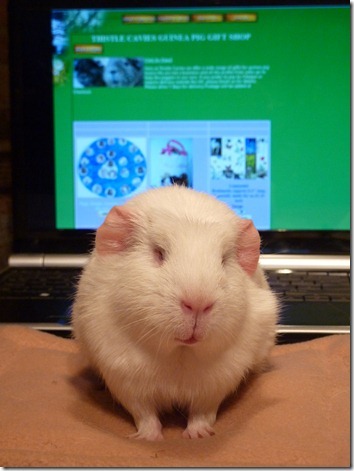 Thankyou for highlighting and supporting piggies in Rescues. Big hug to you. I have amended the details for the North Shields / North East Guinea Pig Rescue – I’d inadvertently moved them to the USA. Sorry! If anyone can recommend a rescue organisation that has been particularly helpful then please let me know if you would like me to add it to this list. 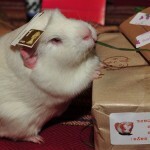 I continue to be in awe at the hard work and dedication by people involved in guinea pig rescue. Please try to support them in any way you can – even the very smallest donation will make a difference. My mommy got me from her friend’s guinea pig (my biological mom) when they found out that she was pregnant (not expected at all!!!). I am now a spoiled little piggie who lives happily ever after every day!!! 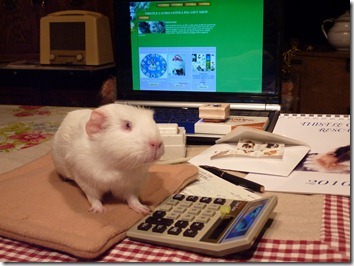 My local guinea pig rescue is cavycareinc.com. 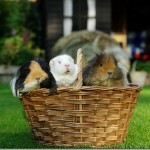 Cavy Care holds guinea pig race that I LOVE going to. Yey, I am so happy to see that Fairy supports shelters! I my self did not come from a shelter, but my mom and I both agree that shelters are the way to go. My local shelter is also Cavy Care Inc.